Shopping list: 2 Armenian cucumbers, ginger, 3/4 pound pork tenderloin, fish sauce, peanuts, mint, basil, 1 lime. Staples: 1 small onion, rice vinegar, oil, sugar, pepper, Sriracha. Pour a couple tablespoons of rice vinegar into a small bowl and add a pinch of salt and a teaspoon of sugar. Slice two Armenian cucumbers into thin rounds, along with a small knob of ginger. Put them into the vinegar and allow the flavors to mingle while you make the pork. Get a wok so hot that a drop of water dances on the surface and then disappears. Add a couple of tablespoons of peanut or neutral oil and immediately toss in one small onion, thinly sliced, and a clove of smashed garlic. As soon as it’s fragrant, add the pork and a tablespoon of sugar and stir fry, tossing every few minutes, for 10 to 15 minutes, until the pork has crisped into delicious little bits. Take the wok off the heat and stir in two tablespoons of fish sauce; it should become completely absorbed. Grind in a lot of black pepper. Remove the ginger from the cucumbers, drain, and mix into the pork. Serve with rice. 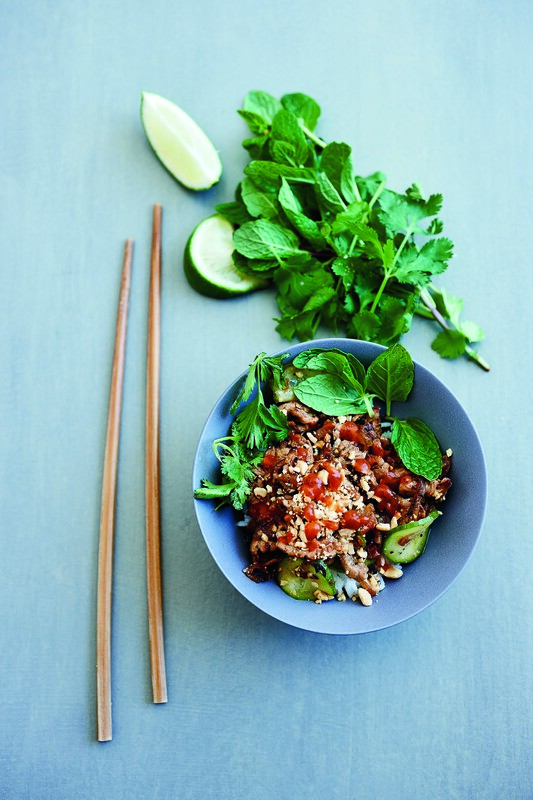 Put fresh mint and basil on the table, along with crushed peanuts, lime wedges and Sriracha, and allow each diner to make a mixture that appeals to them. This will feed two people very generously. Unless you have a very large wok and a ferocious source of heat, the recipe does not double well; you want the pork to get really crisp. I love this. I love your tweets. Thank you. It sounds divine. It also sent me to the Internet to find out what an Armenian cucumber is – interesting, it’s a melon (or from that family). Now I have to scout a couple down.